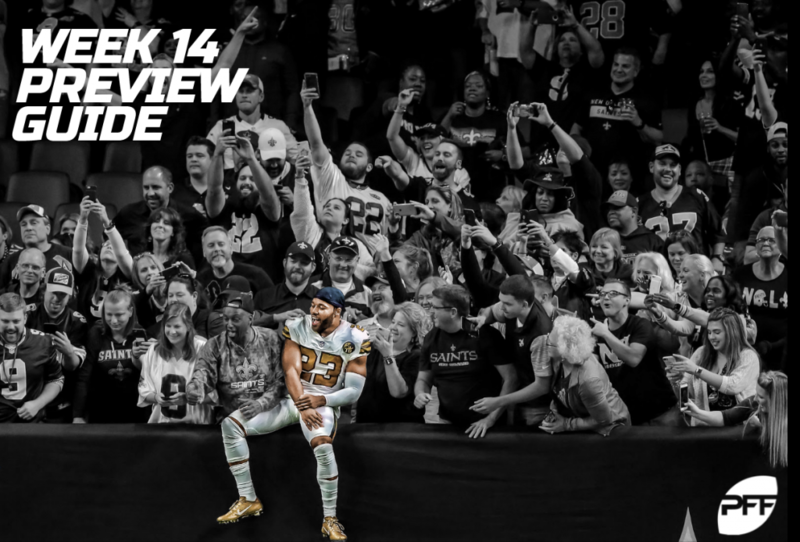 Pro Football Focus’ Preview Team has come together to provide every fan with the right information to best prepare and enjoy Week 14 in the NFL. We offer advanced stats on key NFL matchups, fantasy advice and a Greenline perspective for all the weekend’s games and Monday Night Football. Since the start of the 2016 season, Landon Collins has 71 run stops, which is 21 more than any other safety in that time. Josh Norman was once a name that struck fear in fantasy players any time their receivers had to face him. While we do expect a shadow from Norman on Odell Beckham this week, it isn’t something to get too worked up over. Norman is allowing 71 percent of his targets to be caught with five touchdowns in his coverage this season. Blake Martinez has 19 stops on pass plays, which is the most for all linebackers this season. We don’t know how much will change for the Packers with the interim regime in place, but we do know that Aaron Jones is a plus play this week. The Falcons have struggled against the run for much of the season, and opposing backfields have topped 100 rushing yards against Atlanta in each of the last four games. Michael Thomas has a catch rate of 86.7%. That is over 5% more than any other wide receiver in a season over the past decade with 100 or more targets. Opposing quarterbacks have targeted Eli Apple 76 times this season, which is sixth among corners. Apple has especially struggled over the last two weeks with 15 catches on 20 targets in his coverage. Who does that benefit for the Bucs? Chris Godwin. Look for Godwin to have another solid week of production. He’s in the WR2 conversation. When the Panthers are in the red zone, Cam Newton has an adjusted completion percentage of 84.8%, which is the best for all quarterbacks this season. The popular narrative this week is that the Panthers have struggled against the pass, which is good for Baker Mayfield. But look a little closer. Over the last three weeks, Carolina is allowing an average of 269 yards and 1.7 touchdowns through the air. While those numbers aren’t shut-down, they’re still not enough to justify starting Mayfield over many of your every-week fantasy starters at quarterback. Anthony Walker has 29 run stops, which is tied for second-most among all linebackers. Teammate Darius Leonard is one of the players he is tied with. This isn’t the week to be an Andrew Luck owner. While Luck has largely exceeded fantasy expectations this season, he’s running into a buzz saw in the first round of the fantasy playoffs. Houston has allowed more than one touchdown pass just once since Week 5. Our model likes the Colts here, fading the one-week blip that was the Colts’ 6-0 loss in Jacksonville and the noise that was a multiple-score win for Houston in a game where they allowed over nine yards per pass attempt to Baker Mayfield and the Browns. James White has 36 catches on second down. That is the most by any running back this year. If he gets one per game the rest of the season, he will have the most for any back in a season in the last 13 years. DeVante Parker flashed upside last week with a touchdown against the Bills. While this uptick is encouraging, it’s wise to keep him on the bench this week. Parker will likely draw a shadow from Stephon Gilmore, who has been excellent this season. Gilmore has allowed just 47 percent of his targets to be caught. While the Patriots haven’t even been 0.500 in Miami during Brady’s tenure, we like them to cover this week, as the Patriots appear to be hitting their stride, while Ryan Tannehill is leading all quarterbacks in turnover-worthy play rate and will likely be without their best cornerback. Mitchell Schwartz has allowed pressure on 2.5% of pass blocks this season. That is the lowest rate for a right tackle in the last decade. The Chiefs have won by seven or more games in each of their home games this year, and while they do struggle against the run, the passing game is the most important part of today’s NFL. We like Kansas City to cover on the strength of the league’s current co-MVP Patrick Mahomes. Kicker Stephen Hauschka has made 43 consecutive field goals within 40 yards. That is the longest active streak among kickers. Phillip Lindsay is gaining five or more yards on 45.5% of his carries. That is the best rate for a rookie with at least 150 carries in the last 13 seasons. Who the heck is Jeff Wilson Jr.? He’s a back-end RB1 in fantasy this week. That’s who. The rookie is an unlikely fantasy savior with Matt Breida sidelined, but he’s poised for a full workload as the 49ers lead back. Last week, Wilson racked up 134 scrimmage yards on 23 touches. Expect similar volume for Wilson in this contest. Derwin James has produced 15 pressures on his pass-rushing snaps, which is the most among all safeties. If he continues at his current rate of more than one pressure per game, he’ll set the PFF record for the most pressures produced by a safety in a season. While the point spread (LAC -14) doesn’t offer a ton of intrigue here, the over/under of 47.5 might. The Bengals’ defense is one of the league’s worst, while the Chargers banged-up backfield might mean more throws (and hence more points) from the Chargers’ offense. Hammer the over. Patrick Peterson has allowed 80 or fewer receiving yards in each of his last 67 games dating back to 2014, which is the longest streak we’ve seen from a defensive player in the 13 years we have data for. It’s wise to temper expectations for Kenny Golladay this week. He’s a good bet to draw a shadow from Patrick Peterson when he’s on the outside. While Peterson isn’t necessarily drawing the headlines that he has in the past, he’s been excellent this year. He’s only allowed more than two catches in his coverage once over the last six games, and opposing receivers are seeing an average of just 3.8 targets per game against Peterson. Lane Johnson has gone 89 consecutive pass blocks without allowing a pressure, which is the longest current streak among right tackles. Amari Cooper seems to have found his fit with the Cowboys. In the five weeks since joining the team, Cooper is eight among wide receivers in fantasy points, thanks in part to three touchdowns over that span. He’s been especially good over the last two games with eight catches in each of those contests. Better yet, Cooper gets a nice upgrade this week against a decimated Eagles secondary that doesn’t have a single player currently grading out inside the top 100 corners. Coty Sensabaugh has allowed 0.42 yards per coverage snap since Week 7, which is the second-best for all cornerbacks in that time. Tarik Cohen has 2.78 yards per route run, which is the best for all running backs this season. It looks like Mitch(ell) Trubisky will be back on the field for the Bears after missing the last two weeks. Before the injury, Trubisky was in the midst of a breakout season, but should you use him this week? While the Rams rank as a mid-pack matchup for quarterbacks on the season, they’re actually the top fantasy matchup for the position over the last five weeks. To be fair, they did face Patrick Mahomes in that stretch, but still, the Rams have allowed 14 passing scores over that span. When Frank Clark lines up on the defense’s right side, he has a sack rate of 4.3% this year, which is the best among all edge defenders. Russell Wilson was fantasy’s top quarterback last year, but things haven’t quite gone as well in 2018. Entering this week, he sits ninth among signal callers in fantasy scoring, and his owners may actually want to fade him with their fantasy playoff lives on the line. Wilson draws a brutal matchup against a Vikings defense that has allowed just five passing scores over their last seven games, with opposing quarterbacks averaging just 212 passing yards per game over that stretch.